Make your PC run like new! Protect your data from malware and intruders. Junk files, fragmented drives, and registry clutter will slow down your computer and cause system errors and crashes. System Mechanic Pro combines 6 powerful products to optimize your registry, defragment drives and memory, remove unwanted files, manage installed programs, speed up your internet connection, securely erase sensitive data, and remove malware. 32-bit Windows 2000, XP, or Vista and an internet connection. ...... System Mechanic Professional runs automatically, intelligently cleaning and tuning your entire computer. 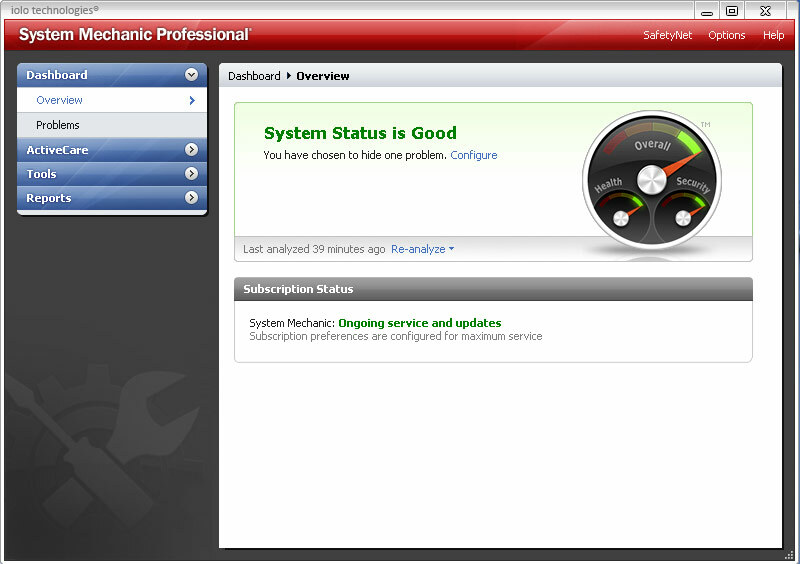 Or you can launch select tools in System Mechanic Professional whenever you think your system may need a boost. Make your PC run like new. Repair system errors for best performance. Qweas is providing links to System Mechanic Professional 11.0.5.2 as a courtesy, and makes no representations regarding System Mechanic Professional or any other applications or any information related thereto. Any questions, complaints or claims regarding this application System Mechanic Professional 11.0.5.2 must be directed to the appropriate software vendor. You may click the publisher link of System Mechanic Professional on the top of this page to get more details about the vendor.